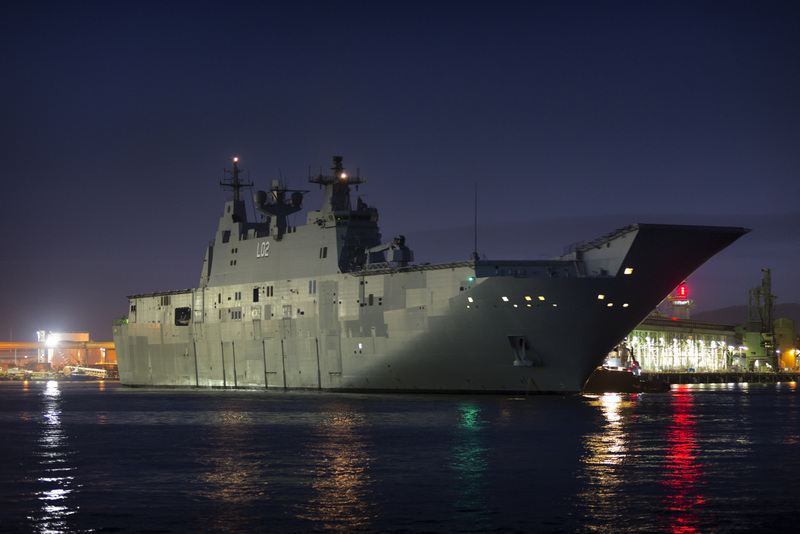 HMAS Canberra is the lead ship of the two ship Canberra class Amphibious Assault Ships otherwise known as a Landing Helicopter Dock (LHD). Based on the Buque de Proyección Estratégica (Strategic Projection Ship) design by Spanish shipbuilders Navantia. At 27,000 tonnes, the LHDs are the largest ships ever constructed for the Royal Australian Navy (RAN) and are being built by contractors BAE Systems Australia and Navantia. 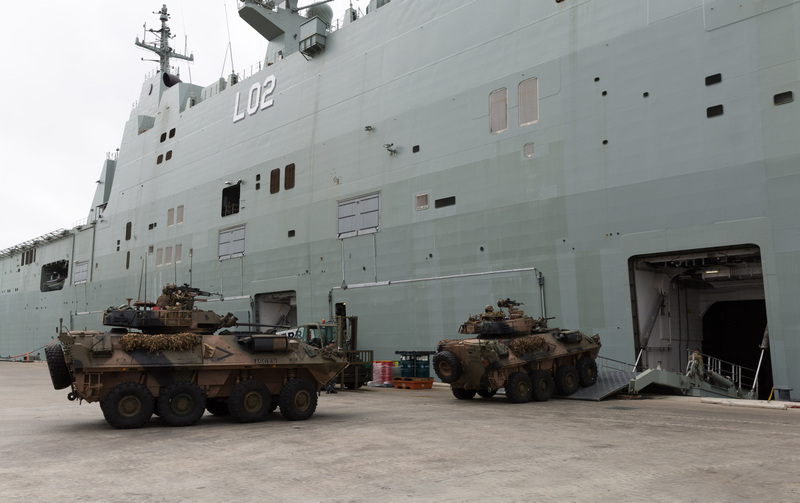 The ships will provide the Australian Defence Force (ADF) with one of the most capable and sophisticated air-land-sea amphibious deployment systems in the world. The ships will contribute directly to the defence of Australia and its national interests, and also allow the ADF to provide large-scale humanitarian assistance, at home or in our region. 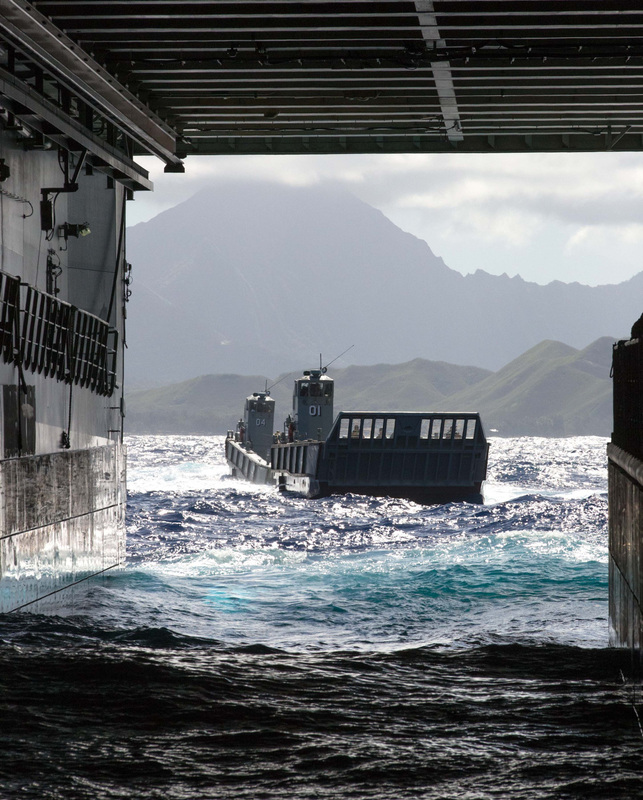 Two of HMAS Canberra's landing craft prepare to enter the ship's well dock off the east coast of Oahu, Hawaii during Exercise Rim of the Pacific (RIMPAC) 2016. A conventional steel mono hull design is employed with the superstructure located on the starboard side of the flight deck. They are designed with the shallowest possible draft to operate in secondary ports and harbours as well as manoeuvre in the shallow waters common in the littoral regions. The construction of the hull to the level of the flight deck and the majority of fit-out is being undertaken at Navantia’s shipyard in Ferrol, Spain. The hull was then transported by Heavy Lift Ship MV Blue Marlin to BAE Systems’s shipyard in Williamstown, Victoria for final construction and fit-out such as the consolidation of the superstructure and installation of the Combat and Communication Systems. The first LHD was named Canberra in an official naval ceremony on 15 February 2013. Canberra is the third ship to bear the name after the Kent class heavy cruiser and Adelaide class guided missile frigate. A Chinook CH-47F aircraft from the 5th Aviation Regiment in Townsville makes an approach to HMAS Canberra while the ship is alongside in her home port of Sydney. Contractor sea trials commenced in February 2014 and were completed in September 2014. The Defence Materiel Organisation (DMO) accepted NUSHIP Canberra from BAE Systems in October 2014 and she sailed to her home port at Fleet Base East, Garden Island, Sydney later that month. Canberra will be able to conduct amphibious operations and land a force of over 1,000 embarked personnel along with all their weapons, ammunition, vehicles and stores by LCM-1E landing craft, helicopters or a combination of both. Australian Army soldiers from 2nd Cavalry Regiment drive ASLAVs (Australian Light-Armoured Vehicles) vehicles aboard HMAS Canberra in Townsville prior to a three-month deployment to Exercise RIMPAC 2016. Canberra is capable of conducting large-scale humanitarian and disaster relief missions. The medical facility is of a size and scope of which would rival some regional hospitals equipped with two operating theatres, an eight bed Critical Care Unit, and a variety of low and medium dependency beds. In addition, the medical facility has dedicated areas to accommodate pathology and radiology services, x-ray, pharmacy and dental facilities. Canberra carries the pennant number L02 and not L01, even though it was the first of its class to be built. Adelaide will carry pennant number L01. This is so the two ships’ pennant numbers will conform to the convention adopted with their namesakes in the Adelaide class. HMAS Canberra was commissioned and joined the Royal Australian Navy fleet in an official ceremony at Fleet Base East, Sydney on 28 November 2014. 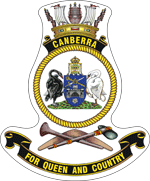 In March 2015, HMAS Canberra was formally designated the flagship of the Royal Australian Navy. HMAS Canberra departs the Port of Townsville during Exercise TALISMAN SABRE 17.